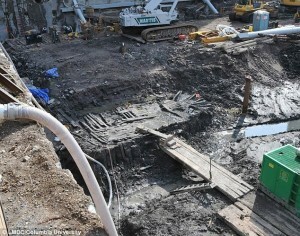 The excavation site of the old World Trade Center twin towers. The recently reported story making headlines discusses the discovery of an old ship which was found at the excavation site of the 9/11 Twin Towers. Although the discovery was made four years ago, scientists have recently reached an explanation for the mysterious find. Discovered 22 feet below street level, the Hudson River Sloop was constructed from what scientists believe is the same white oak tree wood that was used to build Independence Hall in Philadelphia. The rings in the wood suggest that it was cut from the white oak trees in 1773, just two years before the Revolutionary War. Mike Dwight August 5, 2014 Category: General Content. Tagged: 9/11, buried, excavation site, new york, old ship, Twin towers, world trade center.